Acoustic guitars are among the most well-loved instruments for musicians of all ages and levels. The versatile tone of this string instrument beautifully compliments vocals, adds depth to the work of an ensemble group, and even sounds great on its own. In the past, musicians had no choice but to work in a professional studio with an expensive microphone to achieve a high-quality recording of their instrument. Now, you can record the sound of your instrument or vocals at home with one of the many fantastic microphones available for sale. When it comes to selecting one of these products for use with an acoustic guitar, you have many options, as several microphones are well-suited to the versatile sound of this instrument. To find the best acoustic guitar mic for you, set a budget and determine what qualities are most important to you in a product. Whether you have one hundred or several hundred dollars to spend, there is a microphone available to capture the sound of your acoustic guitar. While there are a wide array of fantastic microphones for sale in the music industry today, a few products stand apart from the rest. The five microphones listed below offer excellency on several fronts, and should certainly be up for consideration in your acoustic guitar mic search. AKG was created by Dr. Rudolf Goerike and Ernst Pless in 1947. Determined to provide quality and innovation in the music industry, this company’s microphones were utilized in professional theaters, radio stations, and jazz clubs only a few short months after the brand’s inception. AKG has since evolved into one of the leading providers of microphones, headphones, and wireless systems in the world. Top-caliber musicians have trusted AKG for generations, including Frank Sinatra, Stevie Wonder, the Rolling Stones, Kanye West, and more. 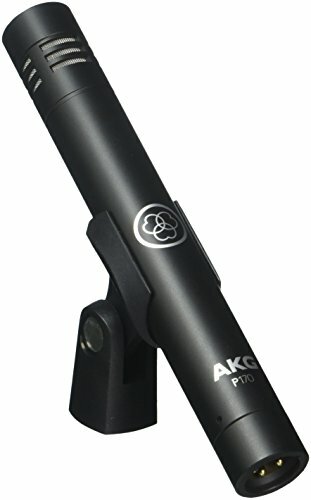 With this impeccable reputation, it is no surprise that a mic from AKG has made it to the top of this list. 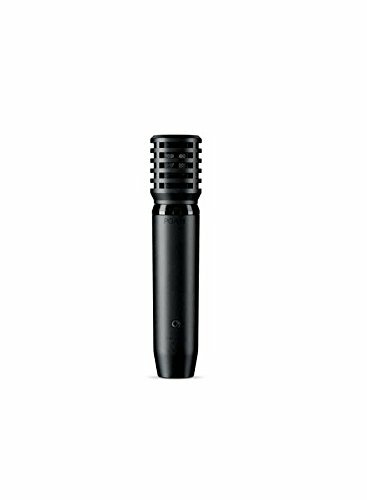 The AKG Perception 170 Professional Instrumental Microphone is a well-rounded and reliable device to fulfill a range of needs. The Perception 170 is a lightweight small diaphragm condenser microphone, weighing in at 4.6 ounces. It has a flat frequency response of 20Hz to 20kHz, which will transmit the guitar’s sound with complete accuracy for a precise recording. The cardioid polar pickup pattern of the 170 blocks all sound to the rear of the device for a honed focus on the area the mic is positioned toward--a great feature for achieving a pure acoustic guitar recording. One of the features that takes the 170 above its competitors is an impressively high maximum SPL of 155 dB. This allows the microphone to handle a higher level of sound without contortion than any of the other products on this list. Also, the 170 comes with a switchable 20 dB attenuation pad for exact adjustment to any application. The Perception 170 mic from AKG is an incredible value, and one of the least expensive options on this list. Factor in a customer reviews this microphone is undoubtedly a top contender. Audio-Technica has been around since 1962 when it burst onto the audio scene with cutting-edge phonograph cartridges. Now, A-T is an international leader in the industry, providing award-winning products including microphones, headphones, wireless systems, mixers and more. This manufacturer has supplied microphones for high-profile applications including the Grammy Awards and the U.S. presidential debates while retaining accessibility and affordability for everyday consumers all over the world. If you are seeking out a top-rated audio product, it is highly likely that Audio-Technica will be a considered brand. The Audio-Technica AT2021 Cardioid Condenser Microphone is the most budget-friendly option on this list. The AT2021 does not compromise quality to achieve this low price tag, however. Customers rave about its clarity of sound, which, along with its cardioid polar pattern, make it an ideal choice for acoustic instruments. While it thrives with the acoustic guitar, is also works well with overheads and group vocals. It weighs in at just under 3 ounces, and the low-mass element allows for excellent response to transients. The AT2021’s maximum SPL comes in at a close second to the Perception 170 at 145 dB; a high level which will allow for precision of sound in nearly every application. This condenser mic offers a wide frequency response of 30-20,000 Hz--again, not at the level of AKG’s 170, but a great range nonetheless. For both at-home recording and onstage, the AT2021 puts out an exceptional collection of features which will do the acoustic guitar justice. Audio-Technica’s AT2021 microphone has earned quite the reputation. Combine that with its corrosion-resistant contact from a XLRM-type connector plated in gold and you have one of the most reliable microphones of its kind. Shure is a longstanding company that is dedicated to quality and reliability in their range of audio electronics. Established in 1925, this company got its start by selling radio-making kits. When radios started being made in factories in the 1930s, Shure shifted its focus to microphones, going on to provide mics to the U.S. military during World War II. Today Shure offers a sweeping collection of audio products including headphones, wireless equipment and microphones. This brand has been utilized in such prominent applications as The Grammy Awards and presidential addresses, but is also firmly dedicated to serving everyday consumers with innovation and value. 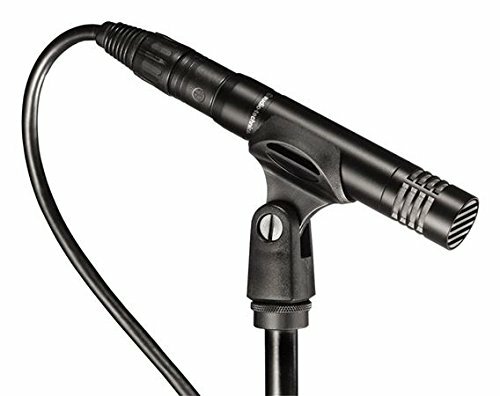 The Shure PGA81-XLR Cardioid Condenser Instrument Microphone exemplifies this company’s reputation for purity and efficiency. The sleek PGA81-XLR microphone is specially designed to compliment the sound of acoustic instruments. It features a cardioid pickup pattern to minimize unwanted sound, making it a great choice for recording and performance applications. This device features a tailored frequency response of 40 to 18,000 Hz, which, while not the broadest range on this list, includes the typical frequencies emitted by an acoustic guitar. Other specifications include a maximum SPL of 129.5 dB and a weight of 6.56 ounces. The PGA81-XLR has been constructed with both durability and effectiveness in mind; the black metallic finish achieves a modern, streamlined look. Additionally, purchase of this product includes many convenient accessories: a 15’ XLR-XLR cable, stand adapter, and protective zipper pouch. The included cable is an exceptional value, and will save you the trouble of finding a compatible cable to use with the microphone. Considering these add-ons and the PGA81-XLR’s high-quality design, the price tag is very impressive. Based out of Sydney, Australia, Rode Microphones is a company that provides affordable, top-caliber microphones to consumers across the globe. Since its inception in the 1990s, Rode has become a prominent force in the audio industry, setting new standards for design and business. Awarded the Australian Manufacturing Exporter of the year in 2013, as well as several Red Dot and Australian International Design awards in past years, Rode maintains a fantastic reputation for innovative products and upstanding business practices. The NT1 Condenser Microphone is a well recommended product from Rode that is built to meet the high standards of a professional musician. The NT1 from Rode is a 1-inch diaphragm condenser microphone that incorporates several leading-edge features to set it apart from the rest. A flat frequency response of 20Hz - 20 kHz delivers a precise midrange with fluid highs to compliment an acoustic guitar. Unlike some of the other products on this list, the NT1 can also execute a full lower range for heightened versatility. One of the most attractive features of the NT1 is its exceptionally low noise level of just 4 dB-A--far lower than the standard 19dB-A. When you use this microphone, the sound of the instrument is truly in the spotlight. The NT1 also features a cardioid polar pattern and has a high maximum SPL of 132 dB. The device weighs in at 15.5 ounces, which is significantly heavier than the other options on this list. So, if a lightweight design is what you are after, the NT1 may not be the best fit. But, this is a minor downfall when you consider the many impressive features the mic has to offer. 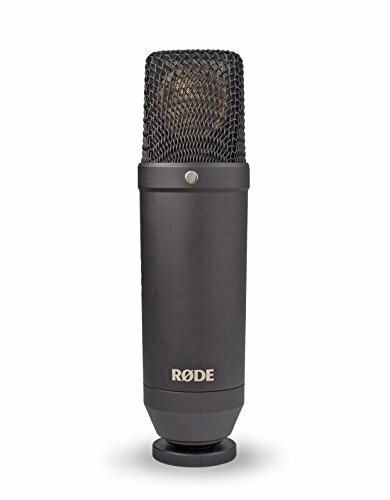 The Rode NT1 Condenser Microphone is a high-end product. This steep price tag is justified by its advanced capabilities. This device also comes with a 10-year extended warranty, ensuring that it will be a reliable investment. The Berlin-based company Beyerdynamic was founded in 1924 by Eugen Beyer, an electrical engineer who sought to manufacture top-grade cinema speakers. Now this brand is one of the premier producers of microphones, headphones, and conference systems in the world. Beyerdynamic strives for innovation in their field, putting out some of the most technically advanced devices available. Also most of their products are hand-made by approximately 220 expert employees in Germany, ensuring a superior standard for quality in every model. The MC930 Small Diaphragm True Condenser Cardioid Microphone embodies the excellency that Beyerdynamic is known for, delivering a modern design and first-rate functionality. The MC930 is a true condenser microphone developed with the requirements of a professional musician in mind. It is ideal for use in a range of applications including solo instruments, orchestras and choirs. The cardioid polar pattern includes a heightened level of off-axis sound rejection to achieve a clean, focused recording. The frequency range is 40 - 20,000 Hz, which is undoubtedly wide, but not quite flat. This will suffice for an acoustic guitar, but does not guarantee a completely realistic transmission in every application. Two fantastic features of the MC930 are the switchable pre-attenuation of 15 bB and the switchable bass roll-off filter with 6 dB/Octave at 250 Hz. The switchable pre-attenuation enables the microphone to function at an exceptional level at high sound pressure levels (up to 140 dB), and the bass roll-off filter makes up for proximity effects. The MC930 conveniently weighs just four ounces. The MC930 from Beyerdynamic is the most expensive microphone on this list by a significant margin. Its price range is aimed towards professionals in the music industry looking for a lasting, top-caliber device. Acoustic guitar microphones come with all different specifications, and it can be tricky to know which factors will make a considerable impact. In this section we will discuss polar pattern, frequency range, and maximum sound pressure level so that you can navigate the specificities of each product you consider. The polar pattern of a microphone determines which sounds the mic will be most receptive to, and will serve as a helpful guide for microphone placement. The three main types of polar, or pickup, patterns are cardioid, figure-8, and omnidirectional. A cardioid pattern is the most receptive to the front of the microphone, picks up less sound at the sides, and blocks out sound at the back. A figure-8 pattern is equally sensitive to sound at the front and back, but blocks out all sound at the sides. An omnidirectional pattern features the same level of sensitivity to every direction. All of the products that are detailed below have a cardioid polar pattern, but other options on the market may differ. A cardioid pattern is ideal when recording an acoustic guitar because it is the most sensitive toward the direction it is facing; you can simply point the device straight at the guitar to achieve a clear, focused recording. Frequency range, (also called frequency response), is the way in which a microphone reacts to the varying frequencies of different sounds, and is measured in Hertz. A flat frequency response is 20 Hz - 20 kHz and covers every frequency that we can hear. A microphone with this range will transmit every sound completely accurately. You will find that some microphones feature a range that does not include every audible frequency, omitting a portion of the high or low range. This causes the enhancement of certain frequencies and the weakening of others. Generally, a wide frequency range is considered to be ideal. The maximum sound pressure level, SPL, is a straightforward concept. This microphone specification is measured in decibels, and denotes the highest volume of sound a mic can transmit without distortion. A high maximum SPL ensures that the microphone will reproduce sound with clarity and precision--the higher this number is, the better. There are many different types of microphones, but the main varieties include dynamic mics, ribbon mics, and condenser mics. When it comes to the best mic for acoustic guitar, there is no black and white solution in regard to type. However, most music professionals agree that while most varieties of mics can plausibly be used with acoustic guitar, condenser microphones are the optimal choice. Condenser microphones can be broken into two categories: small diaphragm and large diaphragm. Both have unique benefits for use with an acoustic guitar. Small diaphragm condenser microphones are generally regarded as the best devices for acoustic guitars and other stringed instruments because of their ability to accurately recreate speedy sounds. The small diaphragm is well-suited to the quick transients of an acoustic guitar, allowing this variety of condenser mic to pick up sound cleanly, precisely, and with little distortion. A smaller diaphragm can react faster to transient sounds than a large diaphragm because of its lower mass. This type of microphone is also the best option when an even, accurate reproduction is desired, making it the popular pick for concert taping. Small diaphragm microphones thrive in close-miking applications, which is often how an acoustic guitar is recorded. Generally, when recording an acoustic guitar with a small diaphragm condenser, the microphone is placed between 6 and 10 inches away from the instrument. If you are looking for the traditional choice of microphone for an acoustic guitar, a small diaphragm condenser is simply the most logical option. The sound of an acoustic guitar is deep, dynamic, and beautiful. This instrument isn’t just for seasoned experts, however--many young students are drawn to it as they study music for the first time. What’s more, acoustic guitars have a place in a plenitude of musical genres, from folk to pop and even rock. It is evident that the popularity of the acoustic guitar is wholly justified. But, when it comes to recording an acoustic guitar, there are many different approaches to contemplate, with each having singular benefits. To achieve the best possible recording, it’s important to put care and consideration into your choice of acoustic guitar microphone. This article has outlined five of the best products currently available to mic an acoustic guitar, taking quality, durability, and affordability all into account. With the right selection, you are prepared to successfully capture the one-of-a-kind tone of the acoustic guitar for all to enjoy.